Electron Machine Corporation manufactures the world's most rugged industrial, in-line process refractomer. Period. 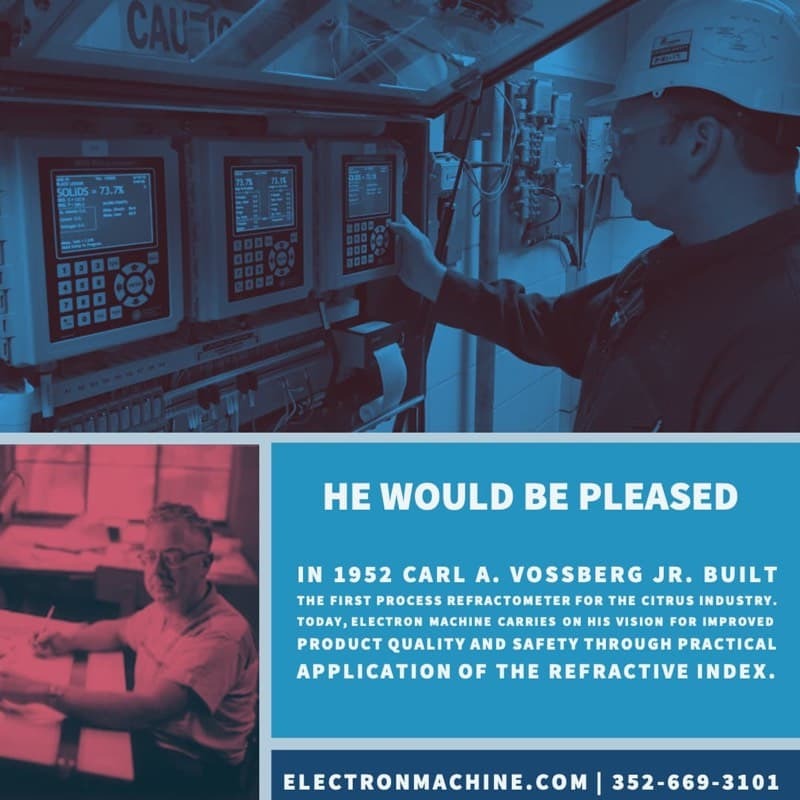 As the pioneer in developing the industrial use of refractive index, Electron Machine’s instruments provide safe, reliable, and accurate process measurement for the pulp and paper industry, the food and beverage industry, and the chemical industry. With thousands of refractometers installed around the world, Electron Machine sells and supports it products through its Umatilla, Florida headquarters and a global network of technical distributors. Electron Machine Corporation is very proud of our unique history and deep roots in the electronic instrumentation industry. Carl Vossberg, Jr., the founder of Electron Machine Corporation, studied electronics at the City College of New York, Columbia University, and the Massachusetts Institute of Technology. 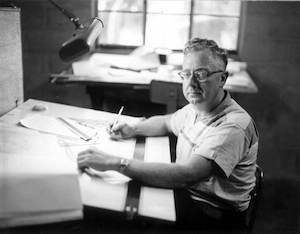 During WWII, he worked for the U.S. Office of Strategic Service (now CIA) participating in the development of remote radio transponders, artillery tracking systems, weapon fire detection controllers, and video transmission. After the war, Carl Vossberg Jr. set out to apply some of this electronics technology to industrial applications. Electron Machine Corporation was formed in 1946 in the back of a radiator repair shop in New York. Instruments for diameter and thickness measurements for steel and cable products were conceived, developed, and licensed to other manufacturers. These instruments include the first commercial x-ray thickness gage, optical cable diameter gages, and an industrial process control computer. In 1952, Electron Machine Corporation moved to Umatilla, Florida, where operations continue today. The first in-line process refractometer was developed to fulfill a need within the developing concentrated Citrus industry and 25,000 square feet of manufacturing facilities were built. In 1977, Carl Vossberg III began the next generation of leadership and expanded the use of refractometers on numerous applications in the food, chemical, and pulp/paper industries throughout the world. Microprocessor technology was integrated into all of the instrumentation vastly improving accuracy and reliability. Manufacturing and designing continues today with another generation of Vossberg leadership. As a vertically-integrated manufacturer, we have complete control over the time it takes to manufacture our instruments providing the highest levels of service and support to our customers. Superb quality control is attained by adapting modern technology and practices to existing designs. These include in-house microprocessor and DSP software design, surface-mount PC card design and assembly, 3D CAD/CAM designing, CNC machining, and MIG/TIG welding. Additionally, our founder's innovative nature is still with us as we continue to research and develop new products.